I love airports. I always do. I don't know why, but since I was little, I love it when my mom invited me to go to the airport to pick up my uncle or aunt when they came visit Indonesia. To me, being at the airport makes me happy, either just to pick someone up or it is me that's going somewhere. 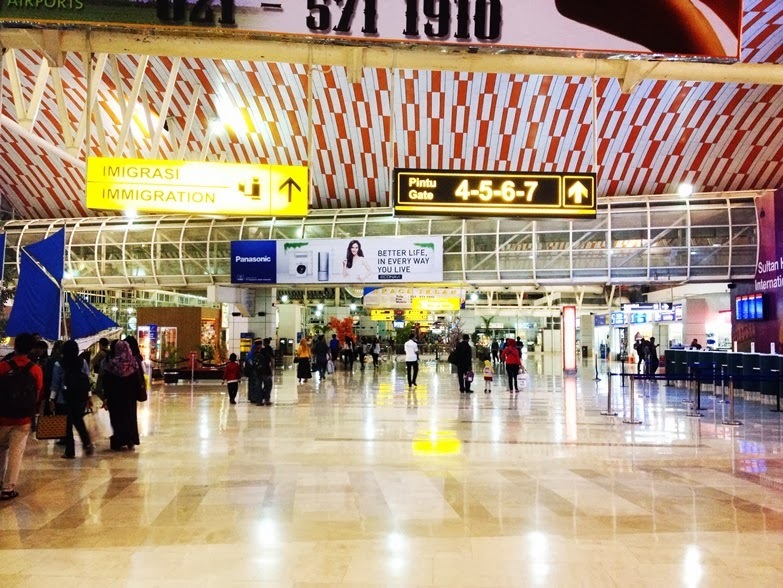 Lucky me, last year I was able to visit several cities in Indonesia, meaning that I got the chance to step my feet in and see several different airports. I notice how some of Indonesian airports are now in the process of a change. They're renovating. In a way, I see that they are rejuvenating themselves. They are now heading to an international standard. 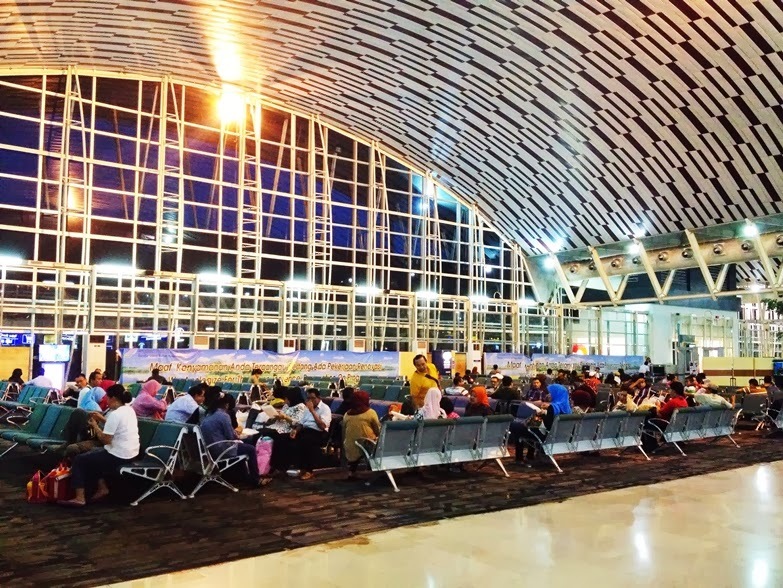 The architecture especially, are now moving towards a more futuristic and "international" airports, unlike the previous that were more "Indonesia". Sultan Syarif Kasim II wasn't very "international" or even futuristic-ly and beautifully designed like the other airports you'll find in the post below. The look and feel was also different. While the other felt more Singapore/Hongkong-ish, Sultan Syarif Kasim II felt more like you're in Dubai with those coconut trees around. But this airport impressed me the most. It was so clean (even to the toilet! ), and this was the first airport that I saw that used an automatic machine that scans barcode on your boarding pass to let you got into the boarding room. Awe to the some! Ngurah Rai was actually the first Indonesia's "international" airport that I visited and I was really impressed with it. Eventhough some parts of the airport were still under renovation and messy at that time, I could already feel the "international" touch to it. *Please note that I visited Ngurah Rai last August, just one day after it was soft launched for domestic departures only. So now, I don't know how it looks like after the makeover has been completed. 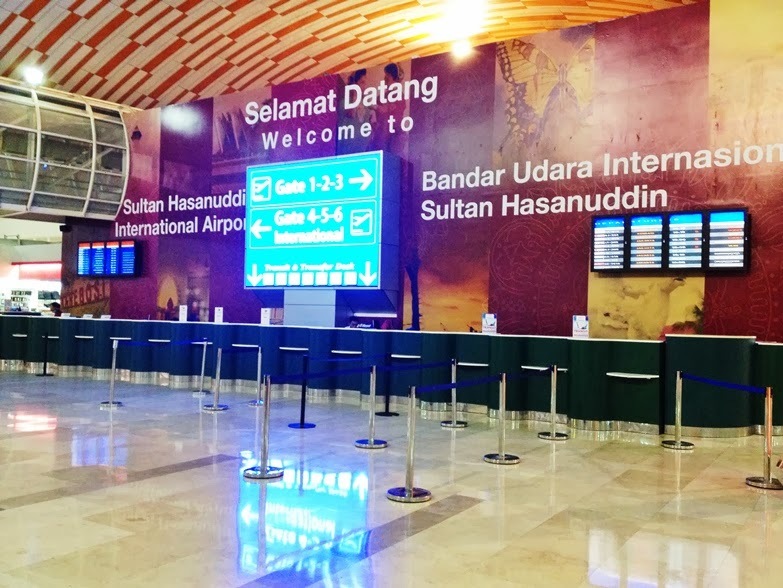 I've heard from quite a long time ago that Makassar has a really nice airport, and I was really blown away by the building's design the moment I stepped into Sultan Hasanuddin International Airport. It was really really nice! Same thing happened when I walked in the check-in counter when I was about to go home. 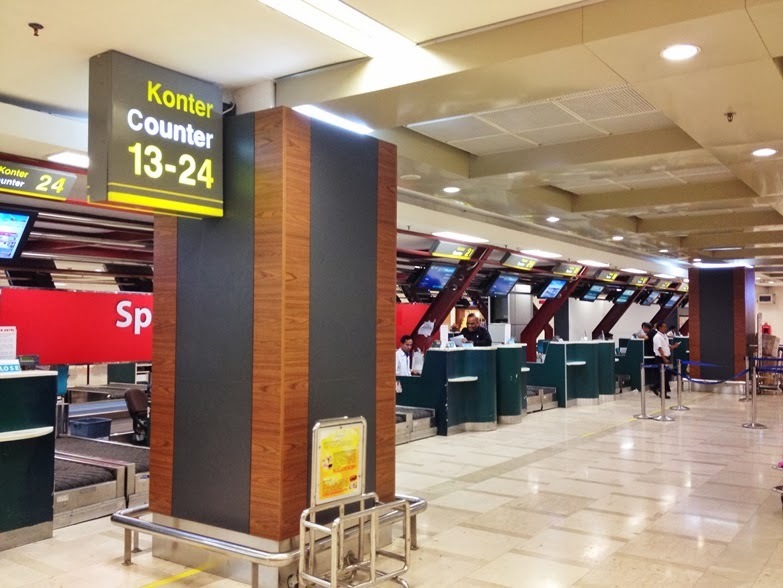 The layout of the check-in counters was similar to the ones in Singapore or Hongkong. But what I loved the most was the boarding area, one level above the check-in area. It feels so "international" - even though the boarding room was still door-less at that time, lol. I remember how Kuala Namu International Airport became the most talk about topic on Twitter, following the release of the introduction video last July. People had a very high expectancy towards this new Medan airport. It looked so magnificent, it made people want to come and see the airport as soon as possible. I finally got the chance to see Kuala Namu with my own eyes last December. I notice at how similar the outer look was with Sultan Hasanuddin Airport. But I was wow-ed when I saw the baggage claim section. It was so different than any other Indonesian airports' baggage claim sections -- the pillars was so high and the design was different than the regular. But apparently, the departure terminal was much more interesting than the arrival terminal. The departure terminal's check-in counters (again) were so similar with Singapore's. It was lined up beautifully. Then I moved forward to the gate and the boarding room and I was even more amazed. It was so clean and beautifully designed, didn't feel like I was at an Indonesian airport. However, one thing were still lacking, though. From the moment I entered the airport until I boarded to the aircraft, I didn't even pass a single X-Ray scanner that scanned my body or my baggage. It popped into my mind straight away that it wasn't the right standard for an (international) airport! If there were no x-ray scanner at all, that means people can smuggle drugs and any other prohibited items outside Medan -- and that's dangerous! So, Kuala Namu's officials, please add x-ray scanners quickly before you ruined your own name by letting smugglers pass by your city easily because you don't scan them (and what they bring). You see, now the architecture are more similar between one another. The look and feel are quite the same. And Medan's new airport, Kuala Namu, brought Indonesia's airport to another level with its integrated train system. So, what do you think? 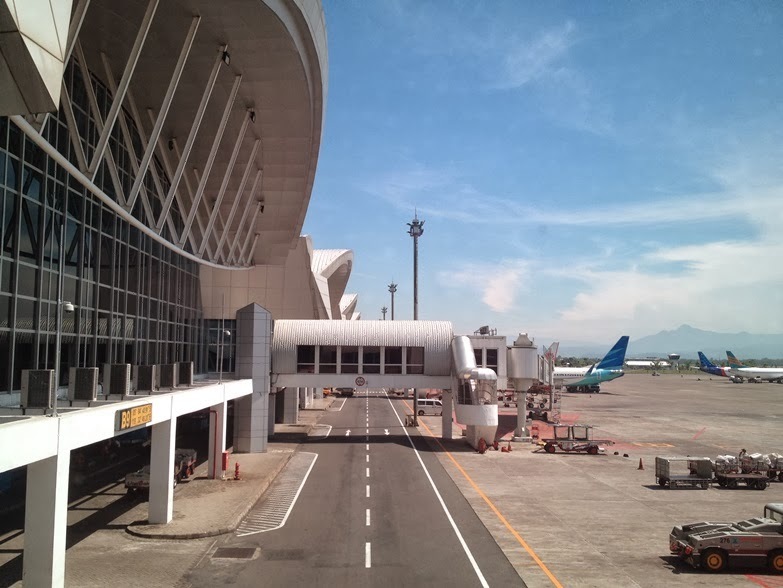 Do you think we need to keep it this way (going with the same architecture and apply it to another airports) or should we make our own "Indonesian style" airports? I didn't know that Pekanbaru has a very nice airport too!